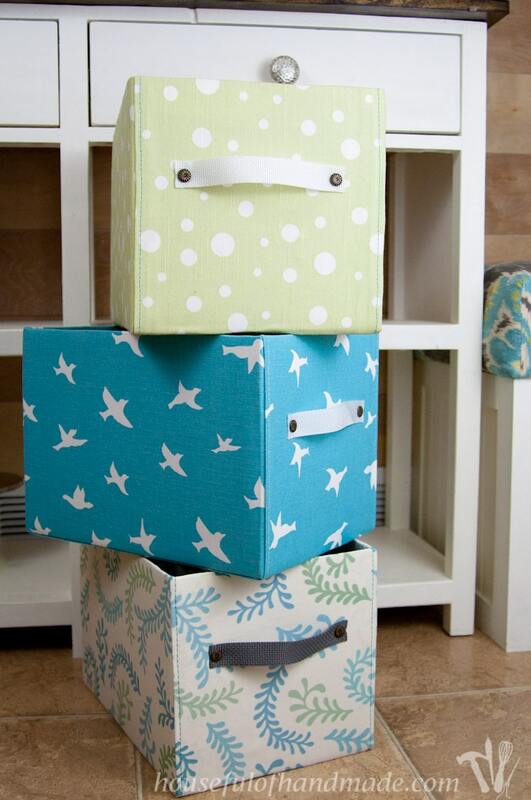 Turn boring cardboard boxes into beautiful fabric storage boxes with this easy tutorial. As I was designing the console for our super awesome coffee bar, storage was a must! I try really hard to declutter, I throw away stuff all the time. I even got caught throwing out my kids artwork. Yikes! Luckily I was able to talk myself out of that one. But even though I do not feel like I am anywhere close to being a packrat, I also feel like there is always a pile of stuff I cannot find a home for. That is why I had to make sure I made our coffee bar with lots of storage. 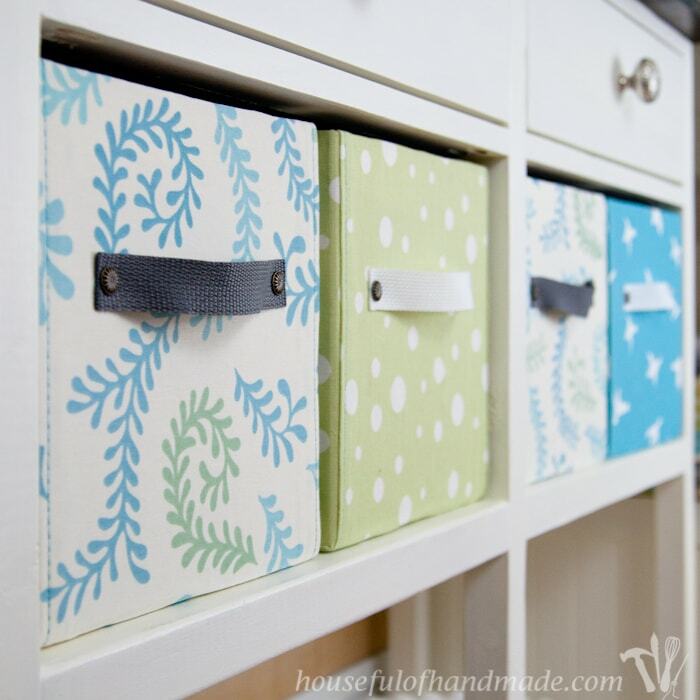 The two drawers were a good starting point, but then I got crazy and added 4 of these easy DIY fabric storage boxes. Now I have lots of storage space for all those little piles. I knew I wanted to put storage boxes on our coffee bar. We need the space to store extra K-cups (we love our coffee so we buy in bulk), random tea and coffee stuff that isn’t pretty enough to be displayed. One of the boxes hides our wireless router, and the other is perfect for me to stash anything that accumulates on the edge of the kitchen island when company is coming over (always a good idea to have an empty place ready for this exact reason)! The problem was I couldn’t find boxes that worked with the dimensions I wanted. I know, when you build it yourself you can make it fit anything, but most boxes are 12x12x12 and that dimension just didn’t work. It was too big for the console. I found this amazing tutorial from Craft Passion and knew I wanted to make my own DIY fabric storage boxes for our coffee console. So I started trying to find some boxes that would fit the space I made for them. Apparently, that was too much to ask for too! I needed boxes that were 10″ wide x 10″ tall and about 13″ deep. I figured it wouldn’t be to hard to find a 10x10x12 box, but I was wrong! I couldn’t find anything but 12x12x12. I eventually came across some boxes that were 9″ tall x 13″ wide x 13″ deep. So close to perfection. I figured I could work with that so I grabbed 5 (always good to have an extra). 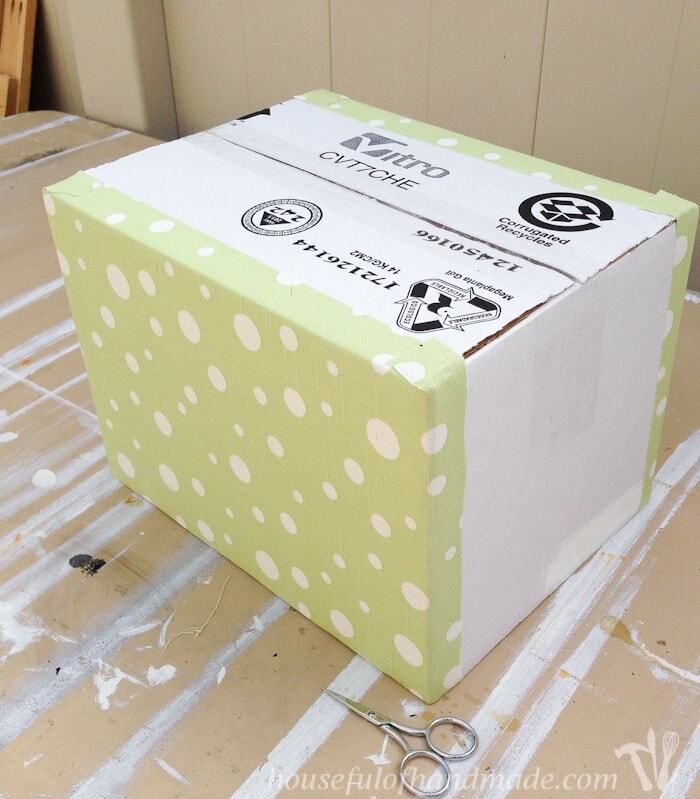 You can make any cardboard box smaller before covering them in fabric. And it is easy with some glue and scissors. Cut apart the tape at the bottom of box. Cut the box apart at opposite corners. Cut the front/back panels of the box to the desired size, plus a couple inches for a tab. Trim the sides of box also if needed. Fold over the tab so the front of the box is the size needed. Glue the tabs the inside of the sides with hot glue. Re-tape the bottom of the box closed. For the side panels I cut them to size plus 2 inches. Then I folded the sides at the 2 inch mark. Using hot glue, I glued the 2 inch tabs to the back side of the front panels. Then I glued the bottom panels together and was ready to go! I ended up with a box that was 9 3/4″ x 9″ x 13″. Perfect. Sadly I got the boxes resized then left them uncovered for way too long! I do that way too often. I filled the uncovered boxes and put them to use, but if I’d have known how easy they were to finish, I would have done it earlier (I think). 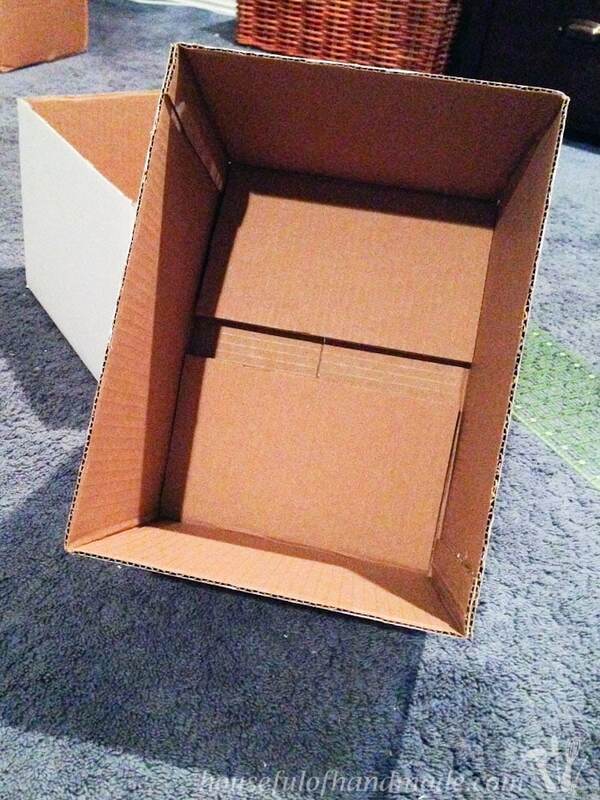 You can make your boxes fit any space with the instructions above. For each box I cut 1 piece at 10 3/4″ x 34″ for the front/bottom/back and 2 pieces at 15″ x 11 1/2″ for the sides. 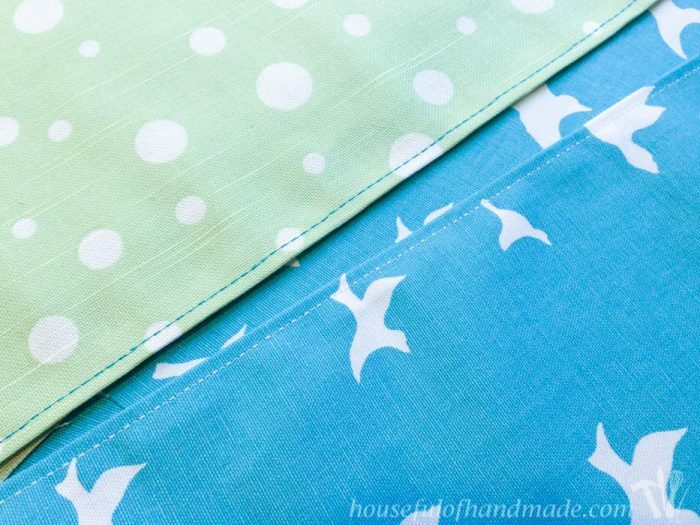 Fold over 1/2″ on each side of the front/bottom/back piece and press (this is where the seam gauge comes in really handy). Stitched a line 1/4 inch from the edge with a contrasting color for some added detail. I used a stitch on my machine that does a duplicate stitch (forward three, back one, forward three, back one, etc.) so it looks like a thick line of stitching. 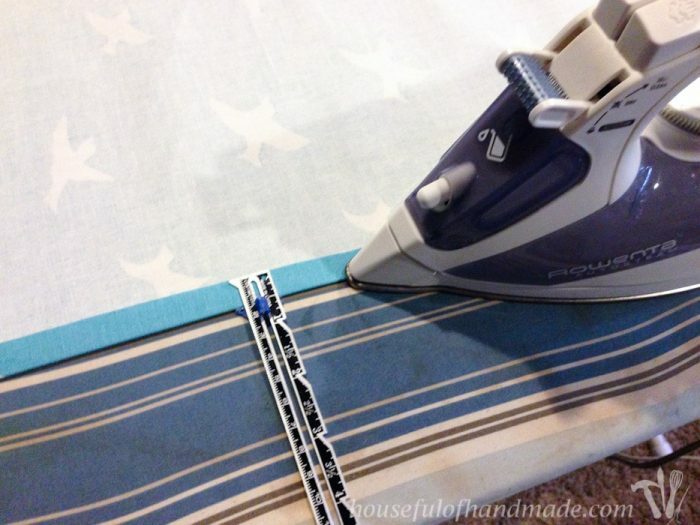 If you don’t have this stitch on your sewing machine you can always use a thicker thread to get a similar look. Now it’s time to glue. 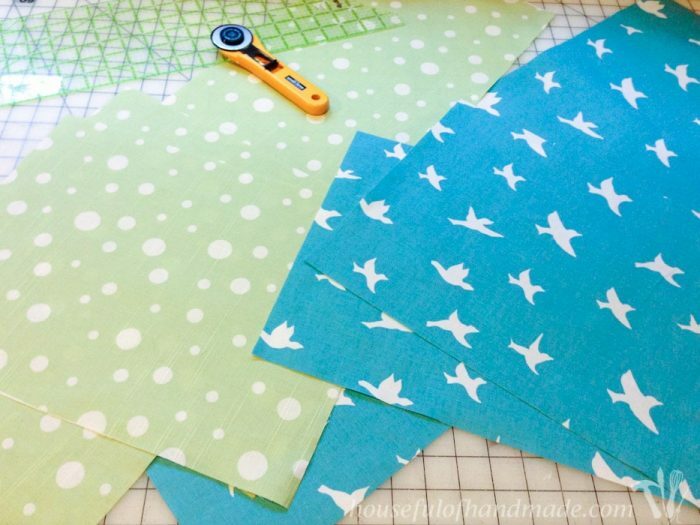 Add spray glue to the side pieces of the fabric. Be careful not to get it on the front of the fabric because it is permanent. Wrap the extra around the sides of the box and make sure they are glued down (use the fabric glue if you need extra glue, don’t try to spray it again or you will get it all over). The corners on the bottom of the box will need to be cut to lay flat. Spray glue the front/bottom/back piece and center it on the box. Smooth it over the whole thing and wrap the edge inside the box. Next, secure the handles. I didn’t take pictures since Joanne’s tutorial is so great. Make sure to check it out to see how to attach the handles. They look so great and I just love the decorative brads! To really make the boxes look fabulous and not homemade, don’t skip the step where you cover the unfinished inside edge with a fun ribbon. I couldn’t believe the difference it made. The uneven, unfinished edge was instantly hidden and made to look even. I used a 3/8 inch wide ribbon so it was super forgiving. And it makes me smile every time I open a box. If you like this project, don’t forget to subscribe to the newsletter where I will continue to share my love of DIY and all the projects in our home. And the colors I chose work with our dining room bench perfectly! The dining room remodel is looking so good (only a couple more things on my to do list). I love your site except the pop-ups and the stuck OVER print Pinterest, Facebook Tweet, G+, and email boxes. This is freaking annoying cause I’ve gotta move it back/forth to read. I want to try some of your projects. Pls take these off! I am not sure what pop-ups you are having on the site Mel, I do not have any pop-ups at all. What browser are you using? 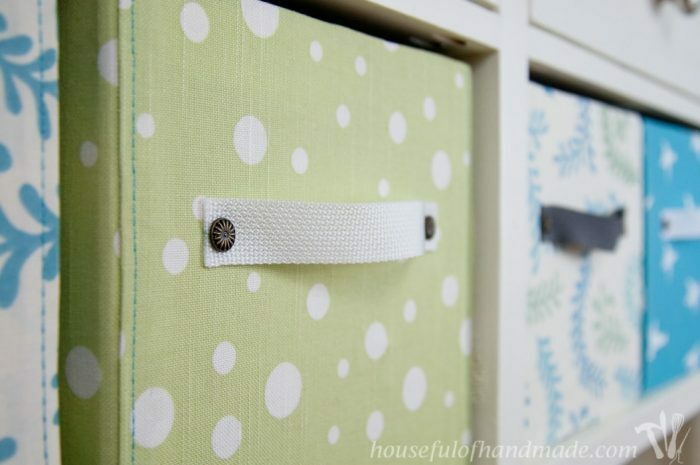 Hello, my 6 yr old granddaughter and I just Absolutely Love Your Fabric Box Storage Idea! We are going to use her Pale Pink with Black Polka-dot fabric along with cordinating Black with Pale Pink Polka-dot fabric to cover the boxes in. She can’t wait to put her Pretties and Toys in them! Thanks So Much for Sharing! Great Rainy Day Memory Maker for us! I love that you are going to make them together! This will be perfect for all her pretty things. Those boxes are really nice ! Pullovers and trousers will be placed in them. Thanks Noelle! I use some of these in my closet to organize my clothing too. Works great! Thanks for taking the time to say hi from France! I could see adding labels to the front of boxes, especially if you make them for a craft room. You could either glue a small chalkboard to the front or tie on a decorative cardboard label. 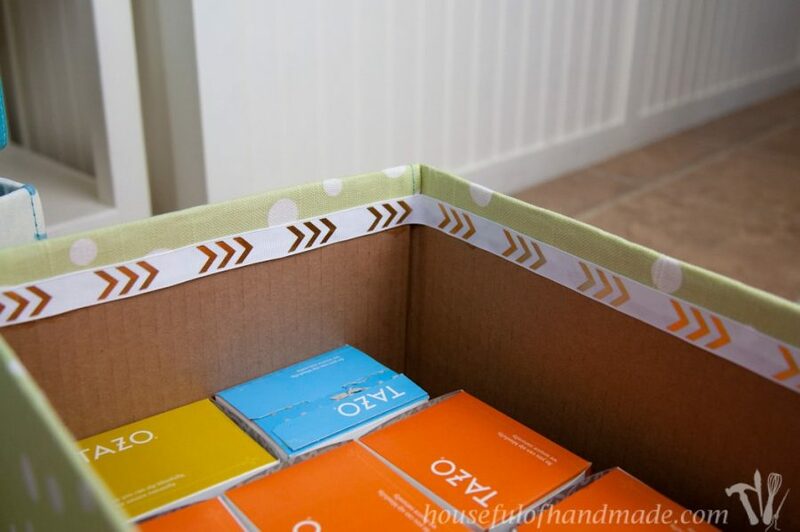 I did something similar to those cardboard pattern boxes that you can purchase at most fabric stores and I even covered the lid. I just wrapped the cloth vertically around the box, gluing down the edges that overlapped the bottom and the inside of the box. Where the ends met, I folded the top edge about 1/2 inch and glued it over the raw edge of the under edge. You can find nice fabric choices in the quilting section of a fabric store. There are even coordinated sets of fabrics to mix and match. Even lightweight home decorator fabric would work. These are all such great ideas! Thanks so much for sharing. Hi, amazing! Where did you find all your supplies? Hello Lynsey. Are there specific supplies you are wondering about? The spray glue, fabric, ribbon and strapping was bought at a craft store. You can use any cardboard boxes you have. If there are specifics you need help with just let me know. I can’t find any fabric as pretty as that! Also, the grommets. The only ones I can find are circular with a hole in the middle. How are they secured on the inside of the box? Just when I’m ready to admit that I have no talent and will never be able to do any of these clever crafts or decorating ideas, I see things like this, so clearly explained and so attractive, and I start to believe that there is hope for even me! Hi, lovely. 2 questions: what do you mean by double stitching, looks like one row reg st to me? Also not on your nor Joanne instr do I see anything about grommets? I think grommets are eyelets you put like onto a shower curtain did you mean the brads or am I missing something? I would think actual metal grommets would be a good idea to preserve the hole of the handle, but not clear. Wonderful tutorial and thanx for the helpful links. Maybe I missed it, but what kind of spray adhesive do you use to attach the fabric to the box? Sorry Penny, I used Loctite brand spray adhesive that was for heavy bonding. I’ve used the 3M brand as well and like it. You can find the spray adhesive at the craft store or home improvement store. The stitching! Genius! Thank you! Thank you! I love the stitching too. These would work perfectly in a craft room. Maybe someday I will get my crafting space organized. Ahhh…I think you solved my yarn storage dilemma! These are so pretty! I would never have imagined they were made from a cardboard box! 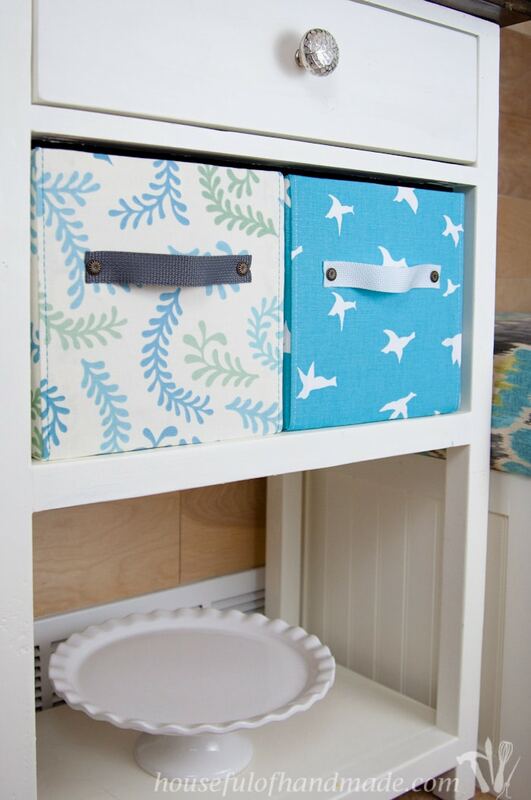 You can really make some beautiful, customized storage with these! Thanks Celeste! I am so excited to do more decorative boxes like this… all out of cardboard! These fabric covered boxes are amazing! Thank you for sharing your posts with us this week at Brag About It! I love the fabric you chose! 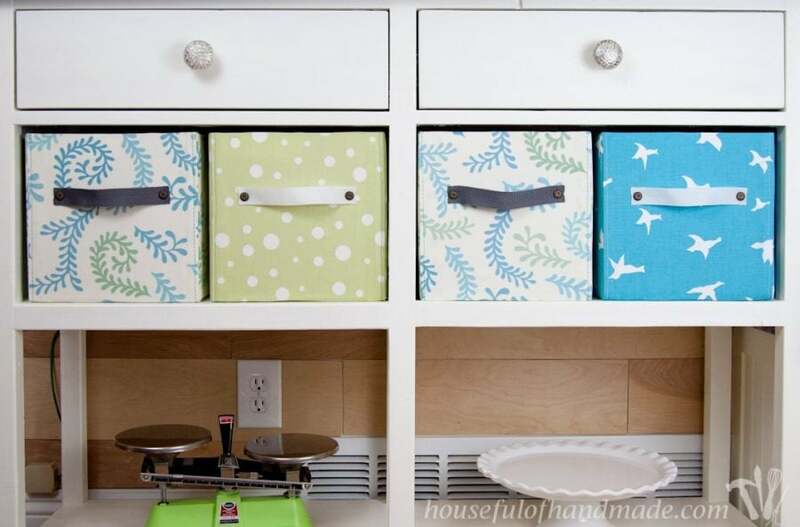 Those storage boxes can be SO expensive, so I love the idea of making them yourself. Nice project and I love your color choice. Great way to create storage. Thank you! I love how the dining room is turning out with these colors. 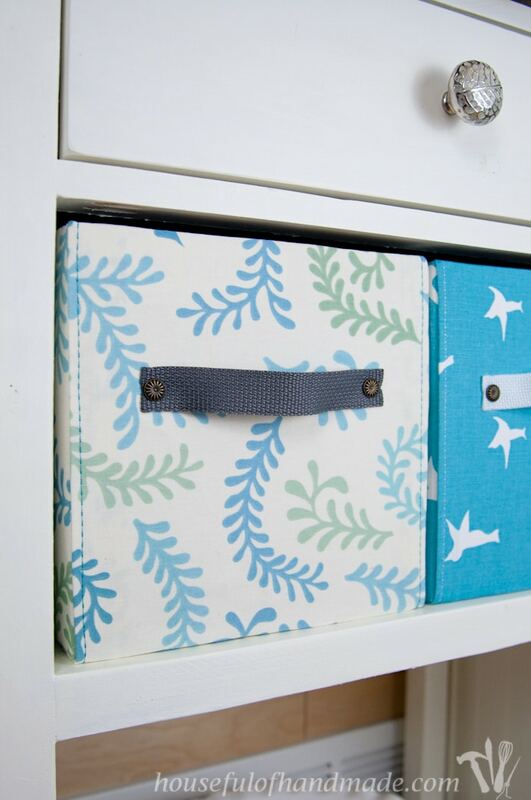 Great idea, I was looking for coordinating storage boxes for when I finally do my laundry room revamp – now I can make my own just using some of the fabrics I already have. Yeah! I love using what you already have. And if you can get cardboard boxes for free these will cost barely nothing! Your boxes look great and better than anything you could buy in a store! Love them! Thank you Vineta! I love how they turned out. Kati, what a great idea and they are so pretty! Thank you for sharing with us at Best of the Weekend – pinned! Have a great week! Thank you Cindy! I love these boxes, no one can tell they are made of cardboard. Cute boxes and so useful. I love that you have an empty one for when company comes over. I’m always just stashing stuff in another room, just to bring some of it back out again. I didn’t realize they were cardboard boxes when I saw the first picture. Love this. Sometimes I feel bad that I plan for stashing my shameful piles, but I’m realistic! I love how they look so nice, not at all like cardboard boxes. I would have never guessed that they were cardboard boxes! Nice work! These are so pretty and professional looking. You did better than store bought. And you were able to chose the fabric you wanted. Can’t beat that. You are so sweet Mary! I think they turned out great. And having total control over prints and colors is a huge plus. 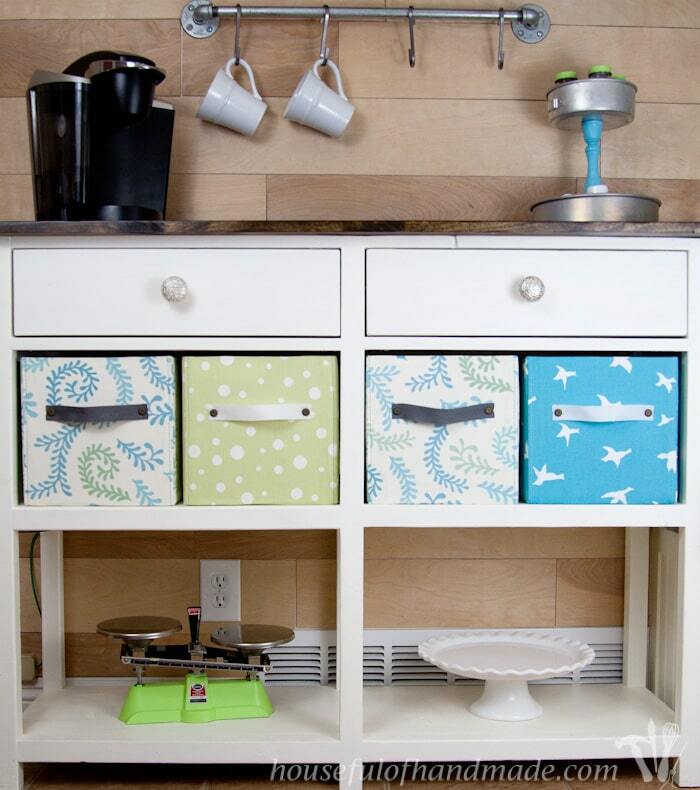 You did a beautiful job on your fabric boxes and I love your coffee station too! Found you on Diana Rambles party – Pinning! Wow, those look awesome! I am always trying to find the right-sized box for my projects, and I never can, so I will definitely use your tips on cutting down the box. I think the stitches and ribbon really finish them. They don’t even look like cardboard boxes from the front. Thank you Rebecca. I love how they turned out, and they are super functional!